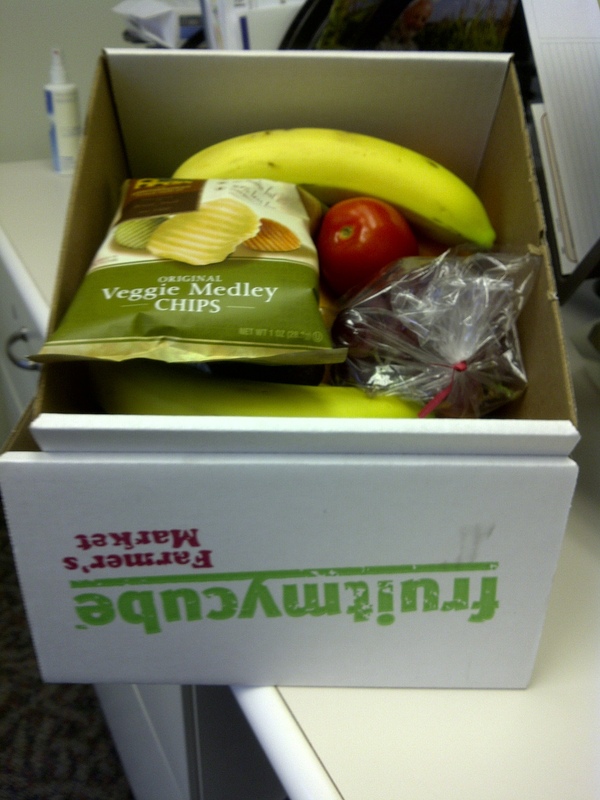 An Easy Way to Eat Healthier - Fruit My Cube - JP loves LIFE! What a great option! 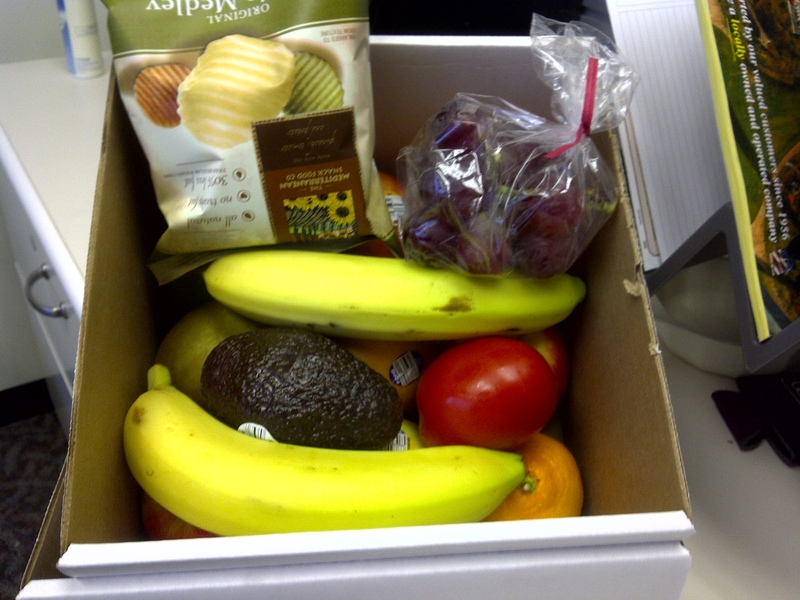 I get fresh fruits (and the bag of veggie chips) delivered to my office & its here all week for me to snack from. I’ve been enjoying the oranges, bananas and grapes. Taking a bit of it home too. That way, fruit becomes the easiest thing to snack on! This is just my first week, but I’m willing to say its a great success so far as I have not been visiting the vending machine that is so close by when I hit that late afternoon craving for something extra! Oh and speaking of “something extra” I got an add-on of a pound of grapes too! One of the interesting things I’ve also seen is that several coworkers have been asking about it. Like me, they didn’t realize this was an option before — thankfully I noticed a new teammate’s box & asked questions a little while ago. (Yeah, Tina rocks!) I’m sharing a bit of the fruit I bought and hopefully more get on board because it makes things so easy! What tips do you have for making eating healthy really easy? Do you have some healthy snacks that keep well in an office a little longer? I am a huge fruit and veggie eater, so I always have some on hand. I like my apples or bananas with peanut butter. My other go-to is muffins. I bake them a lot and adjust the recipes to be healtier. My niece made cookies last weekend and used whole wheat flour for half of what was called for… seems a really tiny way to use more whole grains, but it worked. The cookies were still REALLY tasty too! Not that I really ever sit in an office (unless you count the barn!) but my weakness is coming home and chowing down. So my fix is simply not buying sweets or candies to bring home. Instead I get plenty of yogurt, granola bars, or peanut butter. Kroger usually takes some of their fruit that’s been on the shelf longer and makes fruit bowls at a pretty good price. Oh and I pick up small gatorade bottles to take to the barn. They’re probably a better option than cokes all day. This is great! Even though that option isn’t available here, I could make my own box of fruit for the week. Now that it’s winter, I like to make big pots of soup and then freeze meal-sized portions. It’s a lot healthier (and cheaper!) than buying canned soup. Thanks for reminding me to eat healthy! Thanks a bunch! I have been traveling so much recently I’ve missed doing this more often!